Celebrate the start of the academic year with the MavsMeet Convocation at 4 p.m. today, Tuesday, Aug. 23, at College Park Center. Ya'Ke Smith, assistant professor of film and video, will give the keynote address, followed by remarks from campus leaders and musical entertainment. Stay around for live music, games, and fun at the AfterParty on Spaniolo Drive. See the Maverick Stampede schedule, which stretches into September with informational and social events for academic departments, student organizations, and more. Before the MavsMeet Convocation, join fellow students to kick off the new year with the Maverick March. Gather at 2:45 p.m. today, Tuesday, Aug. 23 , in the Palo Duro Lounge in the E.H. Hereford University Center for food, refreshments, sign-making, a photo booth, and more for a special kick-off rally with Timothy Quinnan, vice president for student affairs, and a group of student leaders. Then march to College Park Center for the MavsMeet Convocation, followed by the AfterParty. Bring a sign, banner, or flag to represent your group or make a sign at the event. For questions, call 817-272-2963. Put on your Maverick blue for a night of fun when the Texas Rangers take on the Cleveland Indians for UTA Night with the Rangers on Friday, Aug. 26. Game time is 7:05 p.m.
Tickets are $15 at utatickets.com for seats in sections 204-209 of Globe Life Park. You must bring your receipt to the College Park Center Box Office and exchange it for an actual ticket by noon, Friday, Aug. 26. The box office is open 9 a.m.-5 p.m. Mondays-Fridays. 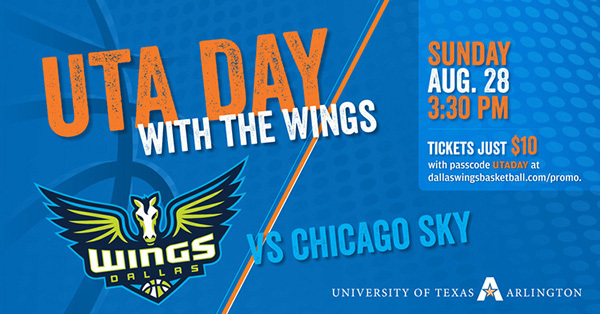 If you need any assistance purchasing your tickets, contact the UTA Box Office at 817-272-9595 or boxoffice@uta.edu. Other parking options include permits for the academic year, one semester, monthly, and weekly, and the Maverick Parking Garage. Read more about parking options. To purchase a parking permit, visit uta.edu/pats and click on Obtain a Permit under the big blue P.
Like to sing? Audition for UTA Choirs Wednesday-Friday, Aug. 24-26. UTA has three choirs, and you do not have to be a music major to participate. Singers with previous choral experience or music reading ability are encouraged to audition. The choirs require course enrollment for one hour elective credit. For details and to schedule an audition, visit the choirs' website. The Career Development Center has a new home in Suite 180S of the E.H. Hereford University Center. The 6,000-square-foot space includes interview rooms, a smart classroom, and dressing rooms where students can prepare for interviews. 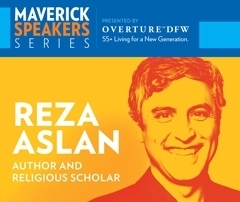 Tickets are available to author and religious scholar Reza Aslan in the Maverick Speakers Series at 7 p.m. Tuesday, Sept. 13. Aslan will speak on "My Journey Through the World's Religions" in Texas Hall. The lecture is free for faculty, staff, and students, and costs $5 for non-UTA visitors. Preferred seating, VIP packages, and season tickets also are available. Go to utatickets.com for details. The College of Nursing and Health Innovation will begin offering a doctoral degree in kinesiology in response to soaring demand for health care scientists and faculty. The degree, which combines elements from kinesiology and nursing curriculums, will have three tracks: movement and rehabilitation sciences, applied physiology, and physical education. Read more. Registration for the fall semester continues with classes starting Thursday, Aug. 25. The MyMav schedule of classes is being updated daily. Plan to validate your course selections closer to the start of the session. The transfer work submission deadline is Friday, Aug. 26, for students who applied to graduate in summer. Read more about graduation deadlines. To be considered for fall graduation, submit your application by Friday, Sept. 11. Read more about applying for graduation. Wheelchair Basketball Movin' Mavs and Lady Movin' Mavs games are a Welcome Week tradition. 4-5:30 p.m. Thursday, Aug. 25, P.E. Building and Maverick Activities Center. Volleyball Mavericks vs. Sam Houston State, 7 p.m. Friday, Aug. 26; vs. Arkansas Pine Bluff, 1:30 p.m., and vs. Sacramento State 7 p.m. Saturday, Aug. 27. Athletics. UTARI Seminar Metin Yavuz of the University of North Texas Health Science Center, "Diabetic Foot Ulceration: Revisiting the Pathomechanics and Prevention Tools." RSVP for shuttle and lunch. 12:30 p.m. Friday, Aug. 26, UTARI, Fort Worth. UTA Research Institute. The Student All-Sports Pass is $25 and is limited to one per student. If you live on campus for the 2016-17 school year or are taking a Mav1000 class, you will automatically receive the pass for free. Blaze's Kids Club for ages 12 and younger includes admission to all UTA home athletic events, UTA swag, and more. Membership is $25 and $15 for each additional child. Upcoming intramural sport deadlines are Madden NFL '17 Tournament, Monday, Aug. 29; Co-Rec Flag Football, Fantasy Football, and College Football Pick 'Em, Thursday, Sept. 1; Tennis, Friday, Sept. 2; Foosball, Tuesday, Sept. 6; Softball, Wednesday, Sept. 7.